I’m not a big fan of using acronyms, but this one, “Precious G.E.M.”, just feels good. When I was young, it was instilled in me that what happened in our home stayed there. So I became what I thought was a very private person, when in reality, I was just afraid. God has promised me that if I share the good things, which he has done for me, with anyone who has the ears to hear, that all the bad things could be expressed in a general way. We have all had some loss, pain, fear, disappointment and hurt, which turns into anger, depression, guilt, and the list goes on!!! So I will fast forward in my story. I was a mess, but realized after much love from my husband, Bret, of over twenty years, my son, Garret, and Ted and Jo Stone, how much GOD loved me; I was God’s mess and he would take care of my mess, if I would only let Him. The time I’ve spent in God’s Word in the past few years has caused me to see that I was raised in a religion that was stuck in the Old Testament laws (the past), which kept me in my past (guilt-shame-blame). Not even knowing how to read a Bible, let alone study it, you can imagine my surprise when Ted and Jo started me in the study of the New Testament. I know now I have been through stages, much like a person grieving. I went through the anger of realizing how much I had been lied to and how much I hadn’t even been told. So I am now going through the stages of my recovery, which are filled with blessings, both big and small. A big blessing was the day I was baptized; I wanted it to be a private party with just my immediate family and few close friends. Then my husband and Ted and Jo explained to me why it would be pleasing to God to be baptized in public, because it might help others to feel the joy of being baptized. I agreed and was told that there were usually 20–30 people each time they held a baptism, so I was comforted by the thought of being able to hide among the other people. Once again, God had other plans. That morning I was in a huge church full of strangers with my image on the big screen and standing in a bathtub. I focused on my husband, son and my pastor, Ted Stone, who were all by my side. Yes, I was the only one who showed up that morning. Be careful what you pray for. I got my private baptism. Fast forward to last October at “First Place 4 Health Wellness Week” in Round Top, Texas. I thought I was doing pretty well at this point in my life, until I arrived in the big state of Texas. Another big mess followed me in the form of the thoughts that had been put into my mind by some of my friends and extended family. They feared that I would be brainwashed or worse yet, find a cult to be part of and I would never be seen again. Since I had never been to any type of retreat before, Satan was having a lot of fun with me in the weeks before I arrived. I spent the first night in tears, mostly wondering how I would survive a week with women I didn’t know, being out in the middle of nowhere, with no television, lamenting over how bored and lonely I would be. The next morning, as I walked downstairs to the “unknown,” I heard a voice, “Hey, Michele! Come on now; let’s you and I go for a walk.” I immediately looked down at the new bright, white tennis shoes I had bought for just such an occasion and accepted the invitation. So with Carole Lewis by my side, we walked and talked and kept walking. She kept saying how grateful she was for the nice weather, but all this girl from California could think about was how humid it was and just how much further we were going to walk. I knew how far we had already come, which meant we were going to have to walk that far back. At this point, even walking didn’t interest me. Then we came upon a large building—a concert hall. Carole started to tell me about it and how she wished she could show me the inside, but the doors were always locked. Guess what? Not that day—and they even had the air conditioning on. It felt so good to be in the cool air and also in such a beautiful grand hall. Since I was a little girl, I had always dreamed of singing in a grand hall like this one. Singing in front of large crowds was one thing that didn’t scare me, and ever since God gave me His songs to sing, the joy has become even more amazing. So there we were, just Carole and me. Then I heard a still, small voice say “Go up on stage,” and with a little nudge from Carole, since nobody had yet asked us to leave, I climbed the stairs to the stage and Carole took a seat in the middle of the hall. As I stood there on the stage dreaming, Carole asked if I would sing one of my songs. So with God as my accompanist, I opened my mouth and filled the beautiful room with His beautiful song. While at Round Top, I was blessed with so much love and a feeling of security that I finally understood what the song “Amazing Grace” is all about. One afternoon, God put me with Euphanel Goad, Carole Lewis and Jo Stone. It was one of the most blessed times in my life. That afternoon I was called “precious”so many times that before that day was over, I really started to believe it. The word “precious” was a feeling I didn’t associate with myself, so when I got home and was sitting at my piano, God reminded me of how “precious” weALL are to Him. That’s where the next stage of my healing began. I was ready to hear the message “First Place 4 Health” was trying to instill in me. I picked up Carole Lewis’ book “Give God A Year” and read it again for the third time, which truly was a charm. I was already spending daily time in the Word, but now, for some reason, His Word, His love and His sacrifice for me took on a whole new meaning. I’ve learned to wait on God and when there is absolutely no question or confusion, I know it is Him. So with that, I would like to share one of the gifts God has given me—a beautiful song, His simple prayer that we would all accept the gift of His Precious Love, because we are all truly Precious In His Sight. I feel I belong here, How ‘bout you? So if I could stay for a while, ‘cause you know I sure so do love that smile. So would you be my sunshine, forever and always? And it’s gonna’ be a good day; yeah, it’s a good day, precious. Simple love is gonna’ carry us through to the next day. is worth so much more than any amount of money could ever buy. I would like to thank my “precious” lifelong friend, John J.T. Thomas, or sharing his gift of music. With his help and support, the songs God is giving me come to life. To everyone who has “ears to hear,” God’s love can do amazing things, if you will let Him love you! 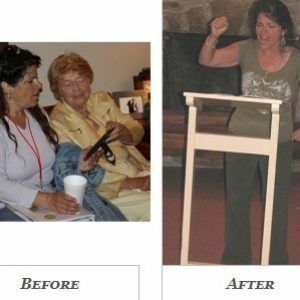 Update: Michele joined us at Wellness Week this year 60 pounds lighter! Michele led us in worship all week and did an awesome job.